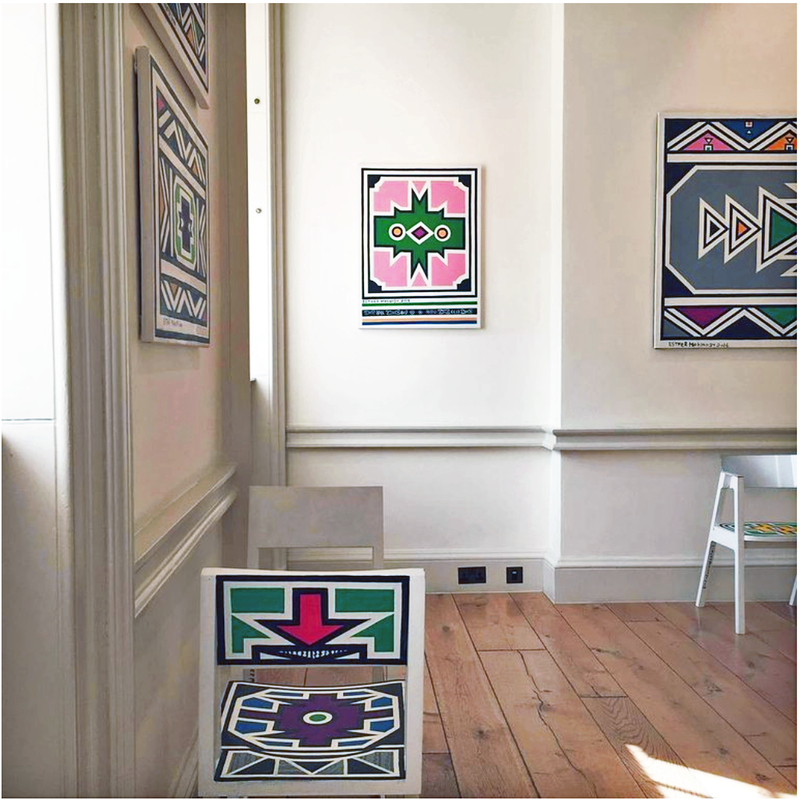 Burning in Water is pleased to feature Continuum, a solo presentation of paintings and custom hand painted furniture by Esther Mahlangu at the1-54 Contemporary African Art Fair in London. As a child in Middleburg, Mpumalanga, South Africa, Mahlangu (b. 1935) learned the art of Ndebele mural painting from her mother and grandmother. Women painting the exteriors of buildings in their communities in large-scale geometric patterns with bold, vibrant colors is a longstanding cultural tradition of the Ndebele. The designs of Ndbele mural painting are often based on Ndebele clothing and jewelry, which women also create. Mahlangu’s paintings translate the design of the Ndebele mural painting to a smaller scale while retaining their defining characteristics. Mahlangu creates the precisely defined geometric compositions of her paintings without the use of preparatory studies. The bold, black lines that define the borders of the composition are painted, per Ndebele custom, with a chicken feather. Esther Mahlangu (b. 1935, Middleburg, Mpumalanga, South Africa) learned traditional Ndebele mural painting as a young child. 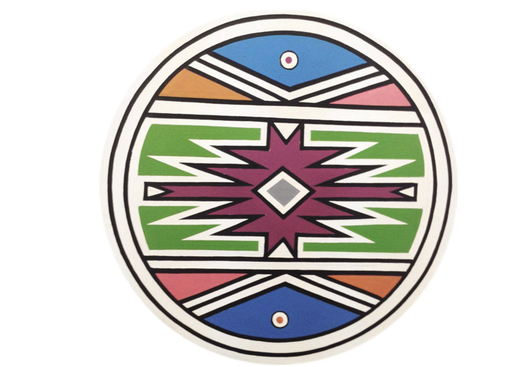 This traditional style of painting features geometric patterning rendered with extreme precision, typically utilized by Ndebele women in their creation of clothing and accessories as well as to decorate the exteriors of buildings in their communities. Decades later, Mahlangu still employs the techniques that she adopted at age 10- painting all of her lines and shapes freehand, using a chicken feather, without stencils or preparatory drawings. Despite her use of traditional forms and techniques, Mahlangu is a resolutely contemporary artist. 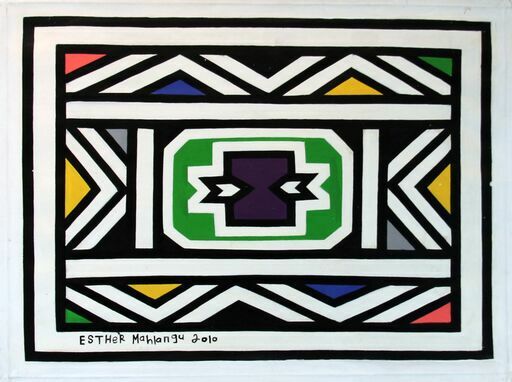 In early adulthood, she began to translate the traditional Ndebele aesthetic into a more individualistic style. She has cited the realization that relatively few people would view her mural paintings in her home region of Mpumalanga as the impetus to adapt her work to other settings. Mahlangu has since painted buildings in Tokyo, created cars for BMW, and painted airplanes for British Airways. Mahlangu became internationally known when she exhibited at the landmark Magiciens de la Terre show of African art at the Centre Georges Pompidou in Paris in 1989. Her art has been exhibited in many major international institutions, including the Guggenheim Museum, Bilbao, Spain; Museum of Arts and Design, New York; National Museum of Woman in the Arts, Washington D.C.; Museum of Art, Colorado; The Philadelphia Museum of Art; Roppongi Hills Art Museum, Tokyo; Pretoria Art Museum, South Africa; Musee des Arts d'Afrique et d'Oceanie, Paris, France; add more? Artworks by Mahlangu are held in many prominent collections, including The Pigozzi Collection, Geneva, Switzerland; World Bank Collection, USA; BMW Art Cars Collection, Germany; National Museum of Woman in the Arts, Washington D.C.; Centre Georges Pompidou, Paris, France; University of Cape Town, South Africa; Pretoria Art Museum, South Africa; South African National Gallery, Cape Town; and The Virginia Museum of Fine Arts, Richmond, Virginia, where she completed two large-scale murals flanking the entrance to the African Art Gallery during a residency in 2014. Today, Mahlangu remains a singular artist. As one of the few women still adept at painting in the traditional Ndebele idiom, she remains a living link to the history of the Ndebele people while brilliantly adapting her work to a global contemporary context. Mahlangu still resides in Middleburg, the town of her birth, where she passes down the tradition of Ndebele painting to young women in her community.